The C-130 gunship was a new weapon system in an old airframe. The high-wing design of this aircraft and its large capacity made it especially suited as a gunship. Having the guns below the wings eliminated the basic problem of the AC-47, also the large C-130 could carry more ammunition for its heavier weapons. This heavily armed aircraft incorporate side firing weapons integrated with sophisticated sensor, navigation, and fire control systems to provide surgical firepower or area saturation during extended loiter periods, at night or adverse weather. There was a number of firsts that one model or another chalked up. Spectre was operationally tested here at Eglin AFB, FL from June to September 1967. It initially deployed to Nha Trang AB, Vietnam on 20 September 1967, and flew its first combat mission on September 27th. Its first truck busting mission was flown November 8, 1967, all A-model gunships were assigned to the 8th TFW which became the 16th SOS. During Vietnam, gunships destroyed more than 10,000 trucks and were credited with many life-saving close air support missions. 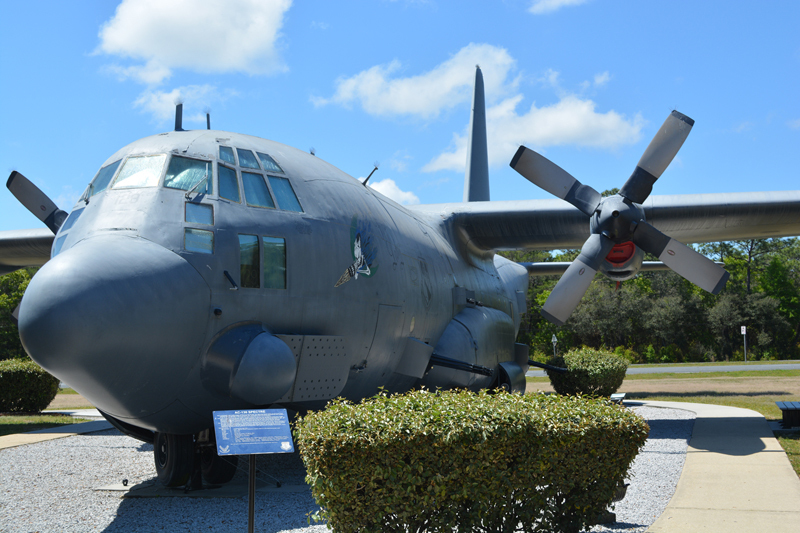 This AC-130A S/N 53-3129 is the first C-130 to come off the production line in 1953, and was the original prototype of what was to become a long line of C-130 aircraft, it is affectionately dubbed “The First Lady”. It was one of five AC-130A gunships retired during an official ceremony, the other aircraft went to the storage. The 711th Special Operations Squadron of the 919th Special Operations Wing at Duke Field, FL was the last unit to fly this magnificent aircraft prior to its retirement on 10 September 1995. After 40 years of faithful service to its country.